This is the second Precision 3420 we try with the same result. Going into BIOS, Turn Off secure boot, then Turn On Legacy Boot. After saving the setting and rebooting the Dell logo screen does not show up anymore. Trying to press F2 or F12 immediately after reboot does not work either. I spent hours trying to debug the issue with Dell technicians and in the end the conclusion is always the same: return the computer. 1) Should I set something different in the BIOS besides those 2 options? 2) Even if the settings were wrong, how come there is no way for the BIOS to gracefully recover? 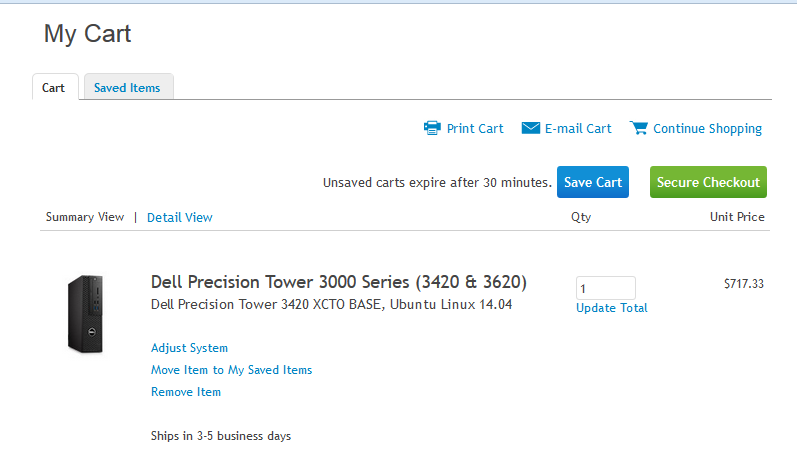 3) Is Precision 3420 the wrong choice for research environment considering we do our work in linux world? UBUNTU 12.04.5 and higher including 16.04 LTS is supported by Dell and does boot UEFI secure boot. before trying to install Linux. Dell does not support Joe and everyones left brother crab shack linux however. Thank you for your answer. This is very insightful. Good to know that Joe's brothers should get off the Dell's turf. We already did. The reason I stress UBUNTU 12.04.5 is that earlier versions can be risky. There are also a number of people who demand that dell support CENTOS, SUSE, MINT, etc. There aren't enough resources to support every distro out there. Dell started supporting 12.04 LTS with the Sputnik project. Dell want's to hear from you! Help us evolve these systems in an open environment. Read and contribute to the Sputnik forum. Check out Sputnik news and reviews and get project details at Dell TechCenter. I agree to some extend that asking Dell to provide support for all Linux distros out there might be relatively too much atm. My request was exactly the opposite though. I wanted zero support from Dell regarding the software I was about to install on this desktop computer. Apparently this is impossible to accomplish. Thank you for the posted links, they are very useful. But just to clarify this is not a case like the one related with samsung laptops. Here we did not boot any other operating system. Simply just disabling Secure Boot and Enable Legacy will brick the machine. No other external software is required to accomplish this except the UEFI the Dell Precision 3420 comes with. Dell provides support for many things including software. However this support is not free. Redhat support is also not free. Ubuntu support is also not free. Dell can even send an engineer to help you build and image of the software you want and then order that directly from dell at the factory. None of these services are free however. The contract for one onsite engineer where I am is $250,000 a year for a dedicated engineer. The Red Hat licenses end up being about $1000 per server and that doesn't include support. If you disconnect the hard drive and disable secure boot and remove the cmos battery it will unbrick the unit and allow installation of Linux with secure boot off. I just tried this and my 3420 was not bricked. The UEFI boot entry and corrupt NVRAM after turning secure boot off is what is causing the black screen of death. If you purchased these systems with Linux pre installed this would not be an issue. We knew about these options as well. But again, in our case we wanted no software support from Dell, an option hard to "buy" from Dell. And this case has nothing to do with software support whatsoever. There are 2 options in UEFI: Disable Secure Boot and Enable Legacy Boot. Turning these On will brick the machine. This has nothing to do with software support. This looks more like a defective UEFI implementation. Thank you for your answer. I went over many steps with Dell tech support, including CMOS reset, HDD disconnected, memory swapping, you name it. Both machines were bricked for good in my case. The drives you have are windows. If you erase the drives and install windows or linux or whatever onto a blank drive with secure boot off it works. The bricking appearance is microsoft's fault for not allowing to install 32 bit os not from microsoft . Ubuntu installs on these systems with secure boot on or off. The exact scenario you say I have tried and it works fine when cmos is cleared and you start with blank drives. Dell does not sell Bare systems with no os. I was also able to pre order a unit online with ubuntu installed. Dell will only support systems with the os that they came with.